Jeff T. uses hard maple for necks because of it's strength. It gives a nice bright attack to the sound of a guitar. Jeff has achieved sound quality with these guitars that is second to none. In my opinion Jeff Terwilliger is the most talented & Innovative Luthier on this planet. A JET Guitar even the new 2011 economy models defy the normal logic most builders use to build a good guitar. The maple is seasoned to 9% moisture content before cutting. A Supreme Earlewood has a three piece flamed laminated neck with an integral 12 degree tilted headstock. Jeff likes to lay out and cut about 30 laminate pieces at a time, so that wood from different boards can be mixed and the grain can be carefully matched for strength in the resulting batch of 10 necks. 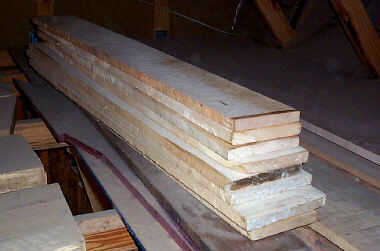 These boards have been carefully face planed for joining quartersawn pieces. After band sawing the pieces, the necks are assembled and glued. Polyurethane glue, the strongest wood glue available, is allowed to cure for 24 hours. Again There Are No CNC machines used in this process. Even the new lower cost versions are still single craftsman built beautiful guitars. A standard Earlewood will have figuring in the neck; either highly flamed maple in the center or outer pieces, or gentle figuring throughout. An upgrade option is high flaming or birdseye in all three pieces. 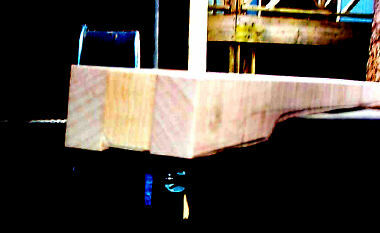 This view shows a typical neck blank with the quartersawn grain symmetrically aligned for stability and strength. Notice the different color of the hard maple from different boards. This process originally made popular by the people at Hamer many years ago makes these necks incredibly strong. You won't find corporate guitars built this way. 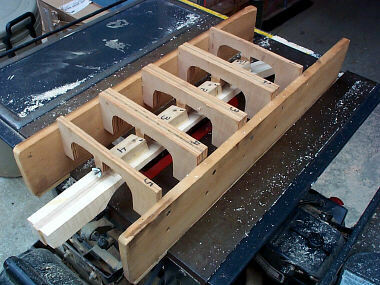 An ingenious time saving jig ready for action: The JET guitar neck carving setup. 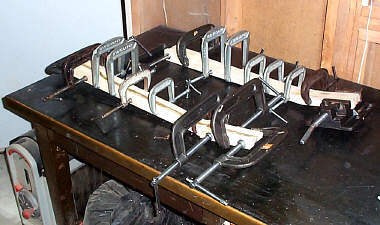 The blank is screwed to a set of precisely made blocks that can rotate the back of the neck over a dado blade on a table saw. By careful stepwise movement, a round neck taper can be rough carved in a straight line. 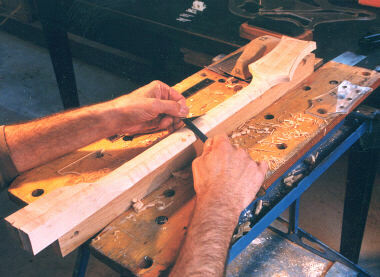 The final shape and thickness of the neck is finished by Jeff himself. The eight small screw holes used in the neck carving jig and in this holding fixture will be routed away by the truss rod channel. It doesn't get any better than this.. In fact we don't even do that in our shop. 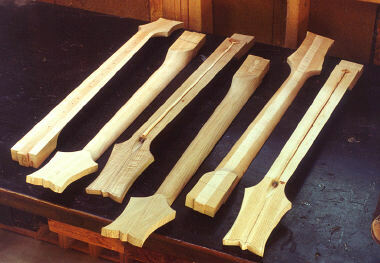 This photo shows various necks, some with truss rods installed and the maple strip glued in. 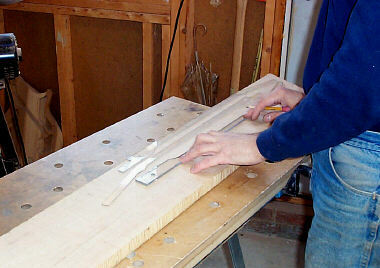 The top surface will be trimmed to accept the fingerboards, which are glued on with epoxy instead of wood glue. That's because of the high oil content of the ebony. 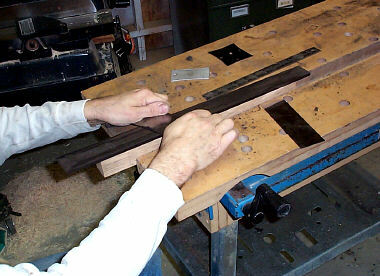 About 120 ebony fingerboard blanks, patiently waiting their turn to be used in a JET guitar. 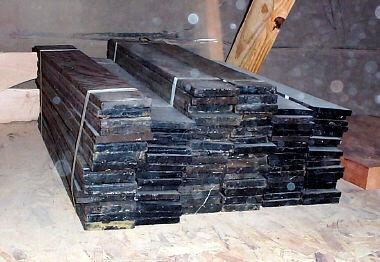 Jeff has an ebony supplier that gets him some of the finest ebony we have seen. The tone of the JET guitars is evident in the quality of the wood used throughout. The lucky fingerboard selected to be next is first planed to 5/16" thickness, then hand carved to produce the famous JET compound radius. A compact rotary tool with custom made bases, along with an assortment of tiny chisels, are the tools used to rout inlays. 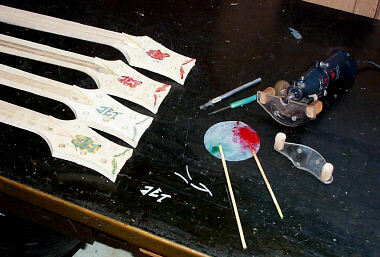 Inlays are glued and clamped using tinted epoxy, to match the final color. This is why the color of a JET guitar is determined early in the crafting process. 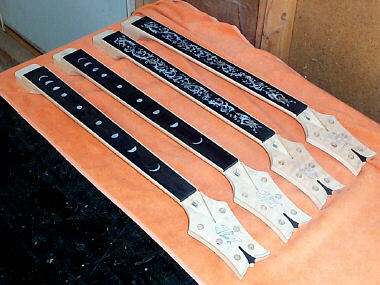 Here are some completed necks with the flame maple binding strips glued in and sanded. They are ready for fretting and finishing. Flame Maple binding is not normally used by other guitar builders. It is much more expensive than ivoroid or plastic. It is also harder to do.